For four and a half years now I have lived here on the coast and hardly a day has gone by that I did not spend time on the cliffs overlooking Little Corona beach - you have all heard me talk of it - it is my sanctuary - my place of worship, and solitude. I brought my Mom in her wheelchair to my spot many a time when she and Dad moved here. A walk across the Goldenrod Footbridge and a stroll down Ocean Avenue brought us to Little Corona. Mom loved the spot - and even on days when a walk in the wheelchair was not feasible I would drive her to the corner of Poppy Avenue and Ocean to enjoy the view while sitting in my Bug. I was not sure I would be able to enjoy Little Corona again for quite some time - I lost my zest for its beauty three weeks ago when Mom crossed over. Yesterday as a rainstorm approached and I was on errands I looked towards the ocean and thought - "oh Mom", "how I wish you were seeing this sky and sea today" - with tears in my eyes I told myself I may never be able to enjoy this again. Last night I signed on the computer and found an email from one of my dearest, most cherished friends, an artist who lives in Los Angeles. 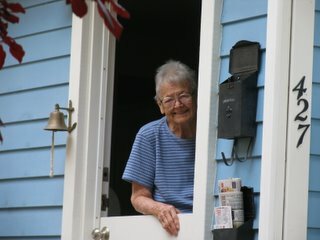 On her way to work, where she manages the library of a Catholic school she was praying for my Mom's soul and my family. She was compelled to write me last night..."While our loved ones are not with us physically, they really are still with us in spirit. They really never leave us. We keep them alive with memories and we honor them by going on with our celebrations and daily activities. Really. So, I thought I'd pass this on to you. It may not make you feel better but then again. So maybe you outta go take a trip to the beach and think about your mom there because that's where she'd like to see you. And maybe she'd feel better to see you trying to enjoy what she wanted you to have." When I woke up this morning I knew I had to walk to Little Corona - and with tears streaming I walked the footbridge I had so recently walked with Mom. I wasn't sure if I could make it (emotionally) to Little Corona. I stopped at LookOut Point - then gathered my courage and walked on. When I got to the cliffs of Little Corona I decided to "ask" for some sort of "unusual occurrence" that would validate for me that my Mom was at PEACE and it was okay for me to enjoy the beauty of our home even though she was not with me. Nothing happened. I was feeling empty and a bit angry. I turned to walk away - and "something" told me to look down at my favorite rock formation where the surf breaks ...and at that very moment a WHITE CRANE appeared, swooping down and landing on my favorite rock. A crane. A symbol of PEACE. My daughter, granddaughter and I have spent countless hours at Little Corona..and not one of us has EVER seen a crane there.